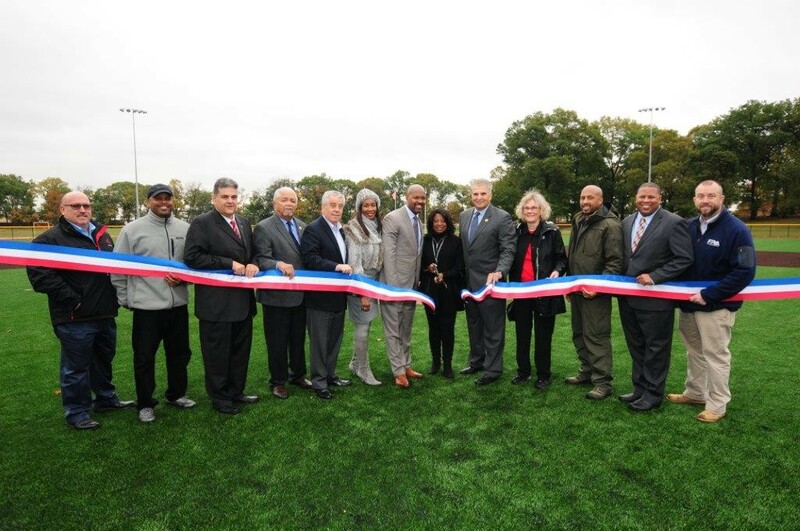 Newark, NJ – Essex County Executive Joseph N. DiVincenzo, Jr. was joined by Atlanta Braves Special Assistant to the General Manager Bo Porter on Thursday, October 27th when he announced the modernization of the Bill Hicks Baseball Field in Essex County Weequahic Park with a synthetic grass playing surface was complete. The field is named in honor of long-time Weequahic High School, South Ward Little League and Project Pride baseball coach Wilbur “Bill” Hicks, who passed away on December 13, 2015. “This beautifully modernized field will stand as a testament to the legacy of Bill Hicks. Bill was a great baseball coach, who used the game to motivate generations of young people, explain life to his players and create opportunities for them to succeed,” DiVincenzo said. “Having this modern field will provide our youth today with an inspirational place to play games, develop teamwork and learn a strong work ethic – three things Bill would be proud of,” he added. “Thank you for honoring a phenomenal man,” said Hicks’ wife Betty. “He touched so many lives through his coaching and always tried to get the most out of his players on and off the field. He was so committed,” she added. “I am blessed to have had Bill as a coach but also as a father figure and role model during my formative years,” Porter said. “I know that because of the legacy that he left behind and with this field, he will continue to live on in the hearts and souls of the people he touched,” he added. Named for Mr. Hicks in May, the field is located in Essex County Weequahic Park adjacent to the Feldman Middleton, Jr. Community Center. After the naming ceremony, it was modernized with a synthetic grass playing surface, new backstop and fencing, drainage system, a scoreboard, dugouts, spectators’ bleachers and a landscaped entrance. The field improvements were designed by French and Parrello from Wall, N.J., which received a $60,000 engineering contract. Shauger Property Services from East Orange was awarded a publicly bid contract for $901,717 to perform the construction work. The upgrades were funded with grants from the NJ Green Acres program and the Essex County Vocational Technical School District. Work started in May and was completed in five months. “I worked with Bill on the Newark Police Department. He was always honest and looking out for the young people in the neighborhood. Having this beautiful facility will be like a safe haven for today’s youth,” Sheriff Armando Fontoura said. “I am pleased that this field was named for Bill Hicks. The improved conditions will benefit our children who play here, and they will be reminded of Bill’s legacy,” Freeholder Patricia Sebold said. “We are in a good place at a good time. I commend the County Executive for upgrading recreation facilities and for naming them for people who have made a difference in the community to keep their memory alive,” Newark South Ward Councilman John James said. Earlier in 2016, the community center was named in honor of Feldman Middleton, Jr., one of the founders of the Weequahic Park Association and the Weequahic Park Sports Authority, and the playground was named in honor of activist Carl Sharif. In 2015, the playground by Building 92 was modernized with new equipment and a rubberized safety surface. In 2012, the four entrances to Weequahic Park received a facelift with traffic islands, lighting, paving and landscaping to beautify the area and enhance pedestrian and traffic safety, and the basketball courts were named in honor of the late Delano Gordon, founder of Above the Rim. Essex County partnered with the National Football League to install a new half-mile fitness course with six exercise stations in 2010. Weequahic Golf Course received a major overhaul in 2009 as part of $7 million modernization project in each of the County’s three public golf courses and the Weequahic Bridge was reconstructed for $3 million. A synthetic grass surface baseball field and four basketball courts were developed as part of a $1.8 million project in 2007. Essex County welcomed The First Tee and its nationally-recognized youth leadership training program to Weequahic Golf Course in 2006. The First Tee constructed a state-of-the-art, three-hole youth golf facility for its program adjacent to the golf course. The playground at Building 96 at the Chancellor Avenue entrance to the park was modernized with new equipment and rubberized safety surface in 2006. The tennis courts on Elizabeth Avenue were rebuilt in 2004. DiVincenzo has partnered with the New Jersey Green Acres program, the NJ Department of Transportation, the Essex County Parks Foundation, Essex County Recreation and Open Space Trust Fund Advisory Board, Weequahic Park Association and The First Tee to secure grants to fund the improvements in Essex County Weequahic Park. The Essex County Park System was created in 1895 and is the first county park system in the United States. It has been expanded to include about 6,000 acres of land and includes 20 parks, five reservations, an environmental center, a zoo, ice skating rink, roller skating rink, three public golf courses, golf driving range, miniature golf course, three dog parks, a castle, Treetop Adventure Course and the Presby Memorial Iris Gardens. Weequahic Park is 311.33 acres, is one of the original five County parks created in 1895 and is the second largest park in the Essex County System.